We continue to be amazed and delighted by re-reading back-issues of SAVEUR, when the magazine still contained really interesting articles and photos. And there are interesting recipes too. But it was never for the recipes that we subscribed. We always got the impression that there was something a little amiss about the SAVEUR kitchen. Not to mention that, often, the way they laid out their recipes was incredibly irritating. Sometimes they were in paragraph form, with the ingredients embedded in the text. Sometimes they were conventionally laid out but missing essential steps in the method area. Always, they insisted on calling for measuring in volumes or weighing in ounces. But. The ideas they gave us with their recipes were wonderful. And, who ever follows a recipe to the letter anyway? Whenever we make something new, we invariably look at as many recipes as we can find and amalgamate. (As I recall, in the days before the internet, my chili con carne recipe came together from 7 different recipes from the various books on our shelves…). So. 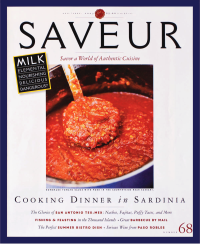 Recently, we had SAVEUR August/September 2003 out to leaf through. And T was entranced by the photo of Italian-style Pork Cooked in Milk (adapted from The River Cafe Cookbook by Rose Gray and Ruth Rogers) that appeared in the issue’s feature about milk. I confess that I wasn’t so sure. I’m not the biggest fan of milk on its own. But, I do love the pasta with Bolognese sauce. Not to mention, who am I to stop anyone from playing in the kitchen? Especially someone who really knows how to cook. After all, eating is my life…. No other food is as versatile, as mutable, as milk, or as thoroughly nourishing; not by chance does it flow through the Old Testament visions of the Promised Land. Symbolic too, of purity, innocence, and simplicity, milk is in fact one of the most complex foods on the planet, in physical structure as well as in the politics that swirl around its consumption and production. We prize other elemental foods like bread—and milk’s own offspring, cheese—and cover them with glory. It’s time milk got its due. We may give our kids milk straight up, but when it comes to ingesting milk ourselves, most of us tend to pour it into our coffee cups or, thanks to centuries of clever cooks and milk’s amazing mutability, transform it into one the many glorious dishes of milkdom, from the familiar—milk shakes, ice cream—to classic preparations from other milk-loving nations. The truth is, we’d rather eat our milk than drink it. In 2009, in the SAVEUR100 that was devoted to “the home cook”, the editors repeated this recipe (I think), changing it slightly, by adding heavy cream. But, can I find it in Issue No.117? Ha. Of course not. And SAVEUR online is no help. For some bizarre reason, for some of the online recipes, they’ve decided not to include which issue a recipe was in. And here I thought it wasn’t possible for them to annoy me more. Yet, they’ve somehow managed it! Of course, T changed the 2003 SAVEUR recipe drastically. Because (and excuse me for repeating myself) the recipes themselves were never the reason we subscribed to SAVEUR…. Instead of milk, he used sour cream (the recipe he mostly followed called for crème fraiche) and instead of fresh sage, he used dried thyme. We’d LIKE to use sage; indeed we WOULD have used sage. But get real… as if there is ever fresh sage available in our garden at the end of winter! Cut pork into 1 inch pieces. Salt and pepper well. Add oil to hot pan and add pork and brown well (about 15 minutes). Remove meat and set aside. Using the same oil, cook onions and then garlic until they turn nicely golden. Return the meat back into the pan along with stock, sour cream, thyme, and sage. Cover the pan and simmer until the pork is fork tender, 2-3 hours. Take the lid off, and reduce the liquid in the pan until it has thickened. Sprinkle in the crushed chili. If the sauce seems too thick, add more stock. Just before serving, remove any bones (the bones add flavour to the stew). Serve with polenta, rice or good bread. We served this ambrosial stew with Persian-style rice and steamed broccoli. We could not believe how fabulous it was! Note that it is quite rich and a little goes a long way. But it was so good that we HAD to have the left-overs again the next night. And then make it again a couple of nights later…. I know that there are some cultures that say never to mix meat and dairy together. All I can say is: Poor them!! They are seriously missing out. As I was going through our photo archives, I came across some from 2008 (! ), that we took after making wonderful bolognese ragù with egg noodles, based on one of the recipes in SAVEUR No.110. Ragù is the food of the poor, of the people who raise the animals and harvest the crops. I grew up in the countryside outside Bologna, and my ragù is my mother’s, and her ragù was my grandmother’s. […] What my family has always added is milk because it’s the most magical of liquids. It brings all the ingredients into harmony with one another, makes the flavors softer, and tempers the acidity of the tomatoes. I enjoy the process: making a ragù gives me immense joy. On October 17, 1982, the Bolognese chapter of the Accademia Italiana della Cucina, “after having carried out long and laborious investigations and conducted studies and research”, decreed the [“Classic” Ragù alla Bolognese] to be the official one. I cannot believe that I haven’t raved about this before. We’ve made it many times since…. This entry was posted in 'Saveur' Magazine review, cookbooks, etc., food & drink, posts with recipes on Saturday, 19 March 2016 by ejm.